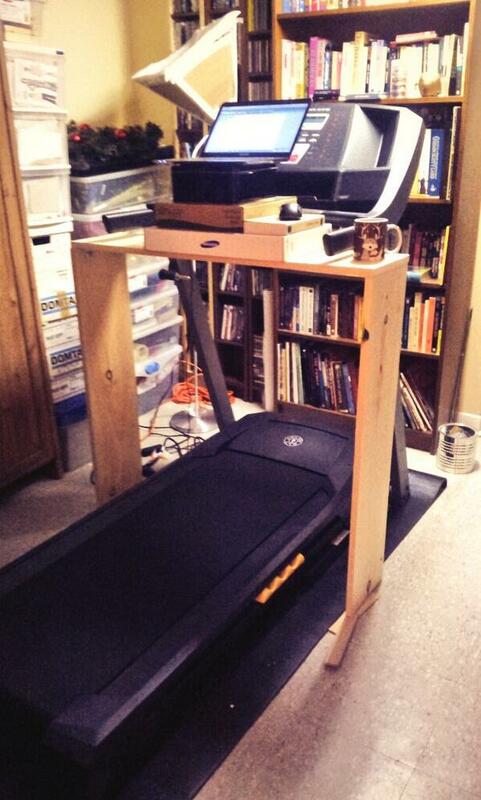 I’ve been wanting a treadmill desk for several years now, but my partner was skeptical about bringing a large, heavy piece of exercise equipment into our not-exactly-huge house – and for good reason, considering how much dust my old second-hand elliptical gathered before we chucked it out! Early this year, I sourced a company that offered home treadmill rentals: they handled installation, maintenance and taking the machine away once the contract was done, all for a monthly fee that matches what my local gym would charge. The idea that someone would haul the machine away if I let it gather dust overcame Jim’s major concerns, and we were off to the (walking) races! I built the desk myself, a fact of which I’m overly proud. The pictured model is V1, which (as you can see) was shorter than I needed. V2 is the same desk with added height on the legs, which raises the laptop to a level where I can comfortably type. So far I’m not having a problem with neck strain due to looking down at the laptop screen, but I do have plans for some alternate desk designs to address that concern if I do stick with the walking desk for more than six months. So far: it’s fantastic! I went a bit too hard in my first flush of enthusiasm and made myself a wee bit sore, but now I’m managing about 3.5 hours a day with no problems. My walking speed is a moderate 1.7 mph, which is an easy stroll. I’m able to type without difficulty, although I’m still getting used to hitting the space-bar correctly, and I can use the mouse well enough to manage basic tasks. I wouldn’t tackle high-end photoshop with this set-up, but for the work I generally do – editing, writing, website maintenance, etc. – I’m not noticing any major problems. Of course, the proof is in the pudding – or in this case, the continued usage. I’m excited now, but will I still be in six months time? A year? I hope so, but I’ll let you know how it goes! Generally I just grab my laptop and move to my regular desk when I need a break. 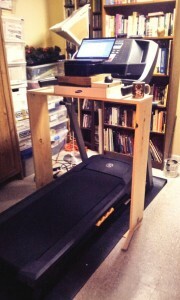 You’re right that a stool wouldn’t really work on the treadmill! I find walking to be less tiring than standing – I tried a standing desk, but I had to shift between standing & sitting so frequently that it became annoying!